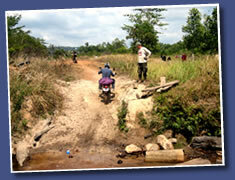 You can hire a guide from us to take you on a day trip into the Cardamons. 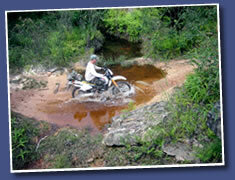 On the day trips people choose off-roading, and others choose the wilderness experience. 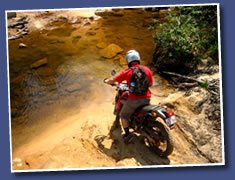 We can take you out into the wilderness to mountains, rivers and forests. Sometimes there's a possible wildlife experience but we cannot guarantee this. It is wilderness after all. The cost of a guide is $100 a day, and you must also pay for the fuel for the guide. And of course you must pay for your own bike rental. Bikes can be rented daily for $25. We provide a crash helmet and the bikes have a full tank of fuel. 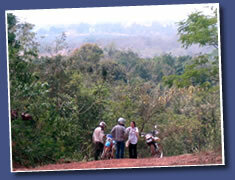 You can choose to stay in guest houses, or hammocks at jungle campsites..
You will be riding on logging roads or gravel roads through one of the most beautiful parts of Cambodia heading towards Palin. We can offer longer trips up to 10 days. The details of these trips can be arranged in person depending upon the ability of the rider, safety is a serious consideration. We can make provisions for the Beginner /Intermiediate/ Advanced. On the first day, the guide will asses your riding skills, at which point a full schedule will be proposed for the tour that you've chosen.